A data class for creating node plugins. See the derived classes for creating standard node plugins, like objects, tags and materials. Use RegisterNodePlugin() to register a node plugin. Gets the GeListNode connected with the NodeData instance. The list node connected with this instance. Cinema 4D owns the pointed node. Reimplemented in EffectorData, and GvOperatorData. Called when a node data instance is deallocated. 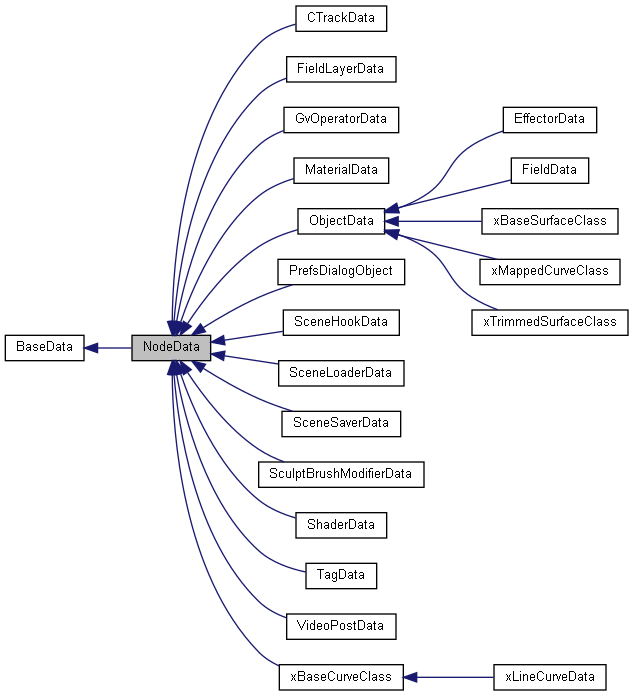 Deallocate member variables of the node data class here. If the node data class has a destructor it is called as usual after. Called when a node is loaded from a file. Init() is called before Read(). It is recommended to store as much as possible in the node's container as Cinema 4D handles the reading of those values automatically. Only use member variables when necessary. [in] hf The hyper file to read from. Cinema 4D owns the pointed hyper file. As an example you may have updated a plugin. If you now need to write additional information for new member variables or changed types for old members increase the level. level is only useful if variables are written/read in NodeData::Write/NodeData::Read. If all values are stored in the node's container, you do not have to deal with the level. true if the node was read, otherwise false. Called when a node is saved to a file. Write any member variable for the node data class. [in] hf The hyper file to write to. Cinema 4D owns the pointed hyper file. true if the node was written, otherwise false. Called when a node is duplicated. Init() is called for the destination node before. It is recommended to store as much as possible in the node's container as Cinema 4D handles the copying of those values automatically. Only use member variables when necessary. [out] dest The destination node data. Cinema 4D owns the pointed node. [in] snode The source node. Equal to Get(). Provided for speed and convenience. Cinema 4D owns the pointed node. [out] dnode The destination node. Cinema 4D owns the pointed node. [in] trn An alias translator for the operation. Can be nullptr. The sender owns the pointed alias translator. true if the node was copied, otherwise false. Called when a node receives messages. true or false depending on the message type. When dealing with strings it is advised to use the string resources files and the GeLoadString function. This keeps the plugin easy to localize for any language to support and makes full use of the language features of Cinema 4D. [in] str The bubble help string. Called to tell Cinema 4D how to retrieve the document for the node. Any call to GeListNode::GetDocument() ends up here. Useful if new BaseList elements are defined. The document for the node. Called to specify that the node acts as a container of other nodes. For the standard node types, for example objects, it is not needed to override GetBranchInfo. Cinema 4D already knows that objects contain tags. [out] info An array of max BranchInfo structures to fill in. Cinema 4D owns the pointed array. [in] max The number of BranchInfo structures in the info array. The number of BranchInfo elements filled in the info array. Called to check if the node is an instance of a base type. [in] type The type to check. Gives a node data the opportunity to route a description ID in the description of a GeListNode to another one. [in] id The source description ID. [out] res_id Assign the target description ID. [out] res_at Assign the target object. [in] docrelated Assign true if the node is part of the document, otherwise false.